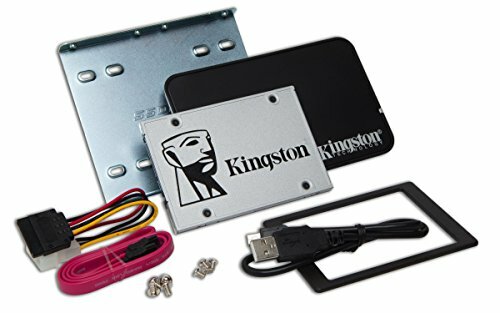 Kingston's SSDNow UV400 is powered by a four-channel Marvell controller for incredible speeds and higher performance compared to a mechanical hard drive. It dramatically improves the responsiveness of your existing system and is 10 times faster than a 7200RPM hard drive (Based on “out-of-box performance” using a SATA Rev. 3.0 motherboard. Speed may vary due to host hardware, software and usage). Rugged and more reliable and durable than a hard drive, UV400 is built using Flash memory so it's shock- and vibration-resistant and less likely to fail than a mechanical hard drive. Its ruggedness makes it ideal for notebooks and other mobile computing devices. UV400 is available in multiple capacities, giving you plenty of space for all your files, applications, videos, photos and other important documents. It's the ideal hard drive replacement and can also replace a smaller SSD in your system to give you all the room you need. The bundle kit includes everything needed to get the SSD installed into your existing system, including a USB enclosure to transfer data, a 2" - 3.5" adapter to mount in a desktop environment, a SATA data cable and a coupon for an Acronis data migration software download (Operating system software support: Windows 8.1, 8, 7 (SP1), Vista - SP1,SP2 - XP - SP3).